I have made an easel card and I have used 'Cuddle Cloud Baby' by Meljens Designs coloured with promarkers and cut out using nestabilities circle die, DP from Pink Petticoat, gingham ribbon and bows, Lace, a CheeryLynn border diecut finishing off with an assortment of buttons. These are both real cute, love those papers & the image is so sweet! Ohhh Laney..there is cute and then there is stinkin CUTE! Thank you for sharing your card over at love to create challenges. Hello Laney, these cards are gorgeous! I do so love the baby image and they are just super cute. 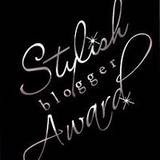 I now have you on my blog list so will be back when you post. You did fabulous creations! Love both. I really like the MelJens Design images... Super Great JOB! These are so sweet Laney, love them ! Both cards are lovely. Sweet image and the gingham is just beautiful. Thanks for joining us at Creative Card Crew in our ribbon challenge. These are both sooo sweet Laney. Gorgeous! Awww Laney, what an adorable card! 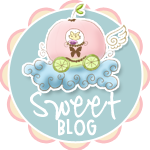 I love MelJen's images, and this baby on a cloud is too cute. Beautiful easel, thank you so much for playing along in our cloud challenge at Raise The Bar! 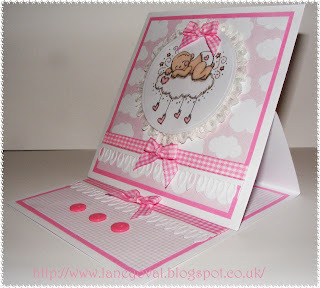 gorgeous cards laney.adorable sweet images and i love your stunning colours. These are both so stinkin' cute. Love the card design. Thanks for joining us this week at Lollipop Crafts. oh so Precious! Fabulous design and beautiful colors! Thanks so much for playing along with us at Love to Create Challenges! Hi Laney these are both beautiful creations, loving the clean fresh designs, the papers, colours and images are super. Wow, both cards are lovely and just perfect for a new born girl and boy. Thank you so much for joining us at Digital Tuesday. Good luck!